Positive displacement flow measurement technology accurately measures the volume of liquid or gas passing through the flow meter by directing the fluid to mechanically displace components in the meter in order to measure its flow as discreet parcel volumes. Prior calibration and sound engineering tolerances ensure superior accuracy and repeatability from many styles and variations of PD meter. Oval gear, nutating disc, diaphragm and helical gear as well as oscillating piston are all examples of meter types that use positive displacement in order to accurately measure flow. Positive displacement flow meters are especially good for smaller line sizes, low flow rates, high viscosity and will last a very long time in service, especially on lubricating and well filtered liquids. How do Positive Displacement Flow Meters work ? 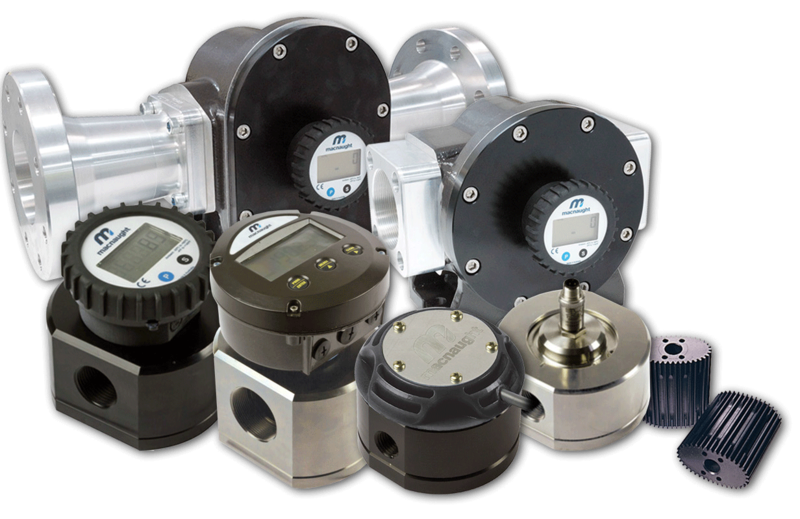 Positive displacement flow meters rely on moving parts to displace quantities of fluid or gas through them and these moving parts must effectively seal against each other to prevent leakage past the metering mechanism (which would result in the flow meter indicating less media passing through than there actually is). In fact, the defining characteristic of any positive displacement meter is that fluid or gas cannot move through it without affecting the mechanism, and that the mechanism cannot move without fluid or gas passing through it. Whatever goes in, comes out and is therefore measured, which is why careful consideration should be given to entrained gases and thier prior removal to avoid measurement inaccuracies in liquid measurement. Very low viscosity liquids at low flows also present unique problems for PD meters. Oval Gear explanation- As fluid passes through the metering chamber by entering the inlet port, it forces the internal gears to rotate and exits through the outlet port. Each rotation of the gear displaces a given volume of fluid. Controlled clearances between the gears and chamber wall insure minimum leakage. As the gears rotate, a magnet on each end of the gear activates the reed switch and forwards the pulses to the display or raw pulse output. ♦ Piston meters are good for low volume measurement applications such as fuelling light aircraft and helicopters. Other industries that use these flowmeters include chemical, pharmaceutical, petrochemical, and food and beverage. ♦ In the chemistry and petro-chemistry industries they are ideal for filling or dosing oils, solvents and chemicals. ♦ Rotary Piston flowmeters are used for the measurement of a variety of fluids including gasoline, oils, liquefied petroleum gas, industrial chemicals, solvents, corn syrup, and adhesives.